Migrants Matter itself was created back in October 2013 with the goal of raising awareness about the situation of migrants in Europe and to put their rights back on the political agendas of EU member states and the EU itself. Their ultimate goal is to protect the rights of migrants and persuade member states to ratify the United Nations Migrant Workers Convention. They have been working to reach this goal through researching and writing articles, holding events and A LOT of lobbying. 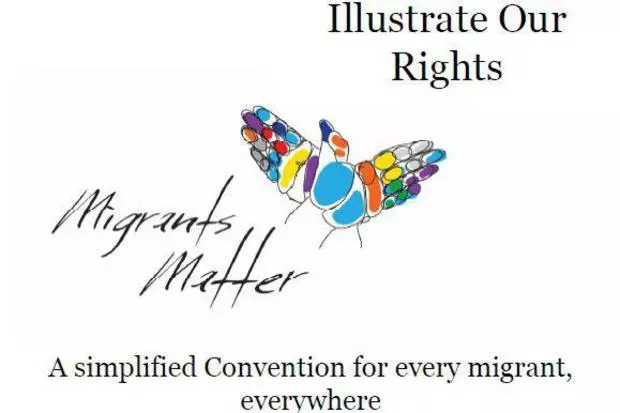 Migrant Matter’s love story with the Convention truly began in February 2015 when Migrants Matter decided to launch the Illustrate Our Rights campaign. They read, reread, simplified, explained, read, ran 20Km for its ratification (twice! ), wrote about,roamed the streets of Venice and lobbied for, defended and read once more the Convention. And now they have decided to make an illustrated booklet out of it that is both easy to read and understand! And why, you ask? Well, there are about 20 individuals from all around the world who share the same passion for migrants rights. What they also share is a love for art.That’s when it hit them to create a booklet with illustrations about the different rights of migrant workers in order to provide everyone (migrants, politicians, NGOS, activists and anyone interested) with the necessary knowledge to understand the Convention. The booklet will explain the Convention in simple, easy to understand language and use works of art to illustrate the rights of migrants. The completed project is expected to be released on International Migrants Day and in Celebration of the 25th Anniversary of the United Nations Migrant Workers Convention on December 18, 2015. Its name? You guessed right: Illustrate Our Rights! This booklet is a unique project, a combination of wonderful art pieces by talented artists and easy to understand explanations of migrants’ rights. Migrants Matter welcomes you to be part of it, follow the process of its development, and be among the first that will hold the result in your hands (or have it in the screen of your laptop!). You can do this by donating and helping them create the first-ever booklet about migrants rights! We will keep you updated about the process until the very end. Migrants Matters is a group of concerned citizens that run purely on volunteer-based power!